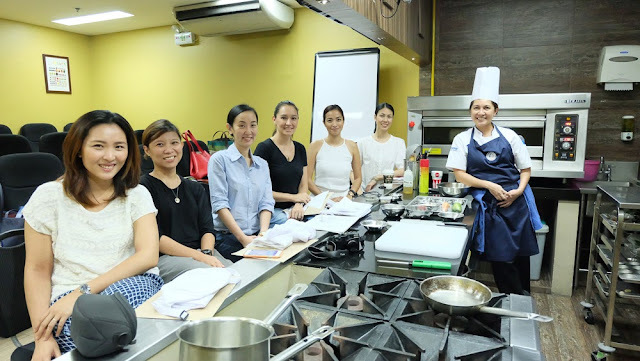 SoMoms Exclusive Workshop at Global Academy + Printable Recipes of What We Cooked! When I moved in and lived alone in a condo, I was pregnant then and trying to avoid buying from fast food so I had no choice but to learn how to cook. Most of what I learned to cooked came from recipes I got off the internet or sometimes I would call my mom whenever I would crave for her dishes. Five years later, I still get recipes from the internet or sometimes from the cookbooks I have. I have a few dishes my family love that I shared some here in the blog thru my Kitchen Attempts entries. 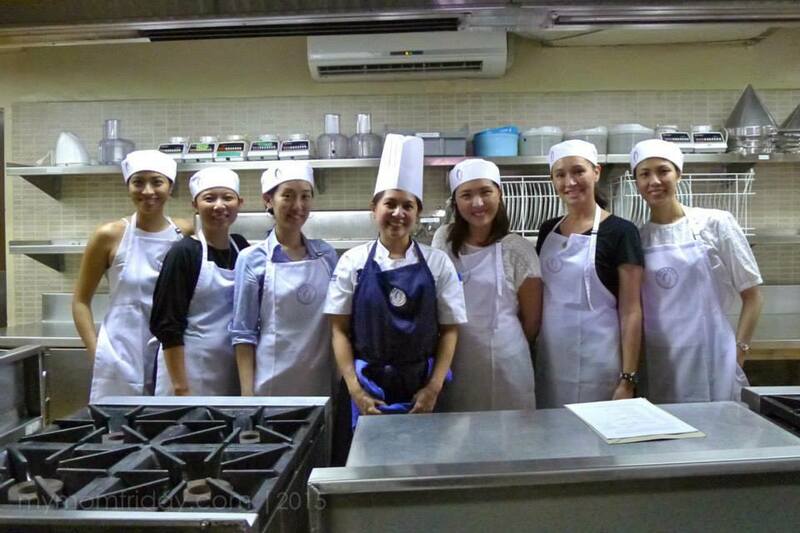 And last week, I had my very first cooking class/workshop at Global Academy with some of the SoMoms and it was a tiring yet fun and fulfilling experience! 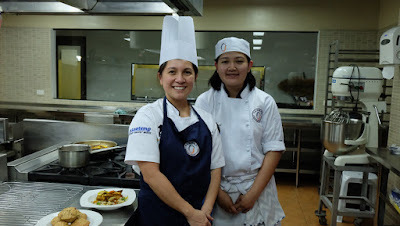 Global Culinary and Hospitality Academy was founded by Chefs Rob Pengson and Benjamin Ledesma, Jr.. 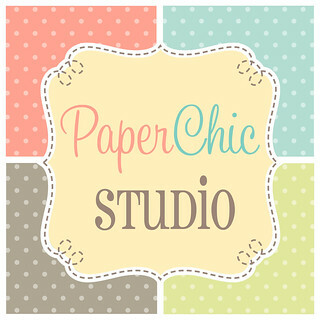 They opened their first branch in Ortigas (where we had our class!) in 2007. 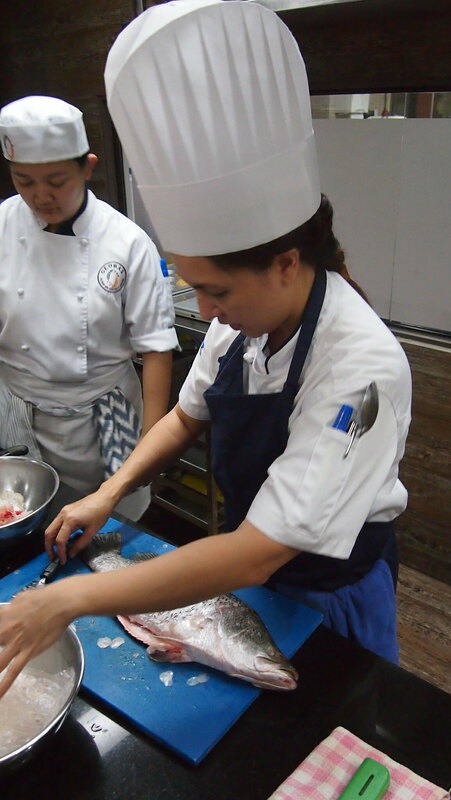 Their mission is to provide relevant education and professional training to students, aspiring chefs and industry professionals at modest rates to prepare them for the growing opportunities in the culinary and hospitality world! 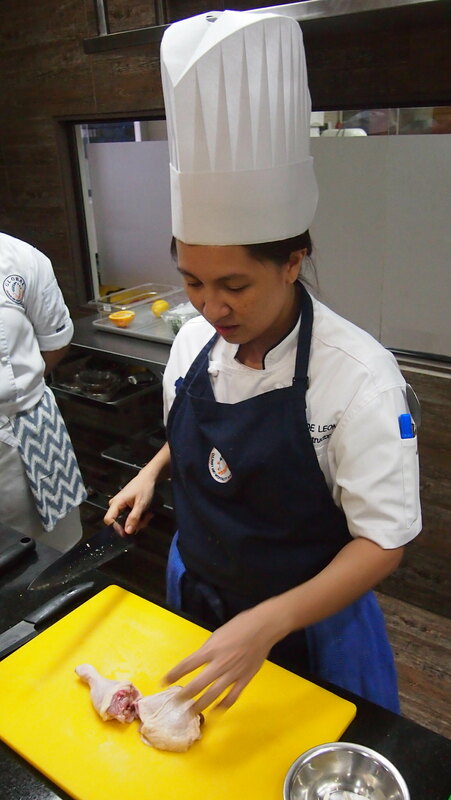 In 2012, Global Academy is the first culinary school in the Philippines to receive The World Association of Chefs Societies (WACS) Recognition of Quality Culinary Education. 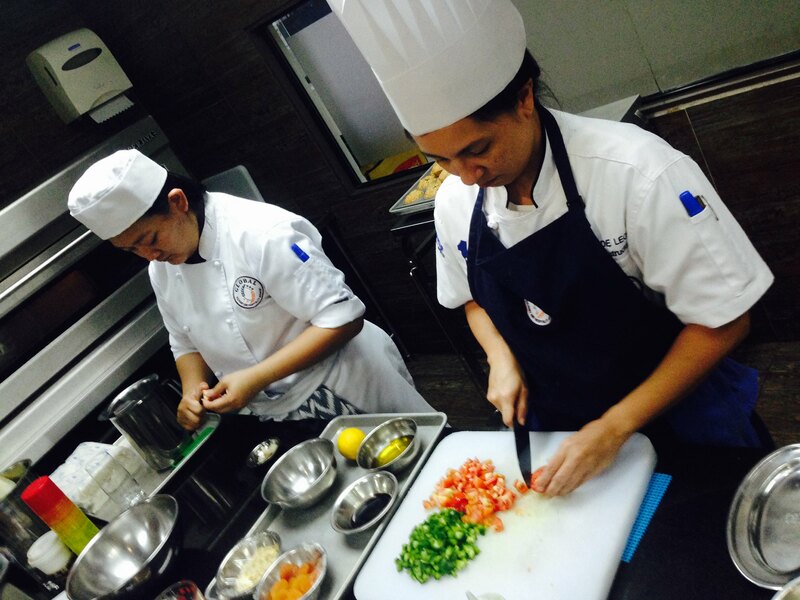 This means that the school’s culinary programs have met WACS’ high quality standards of culinary education. 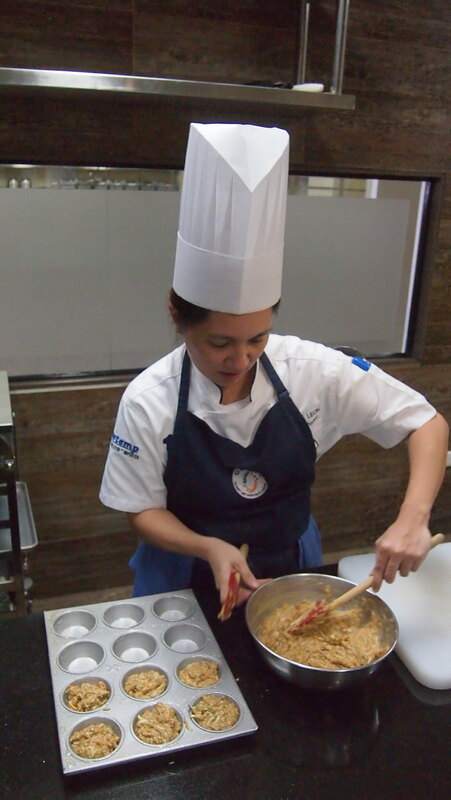 To date, Global Academy has four branches: Ortigas, Alabang, Quezon City, and Makati. 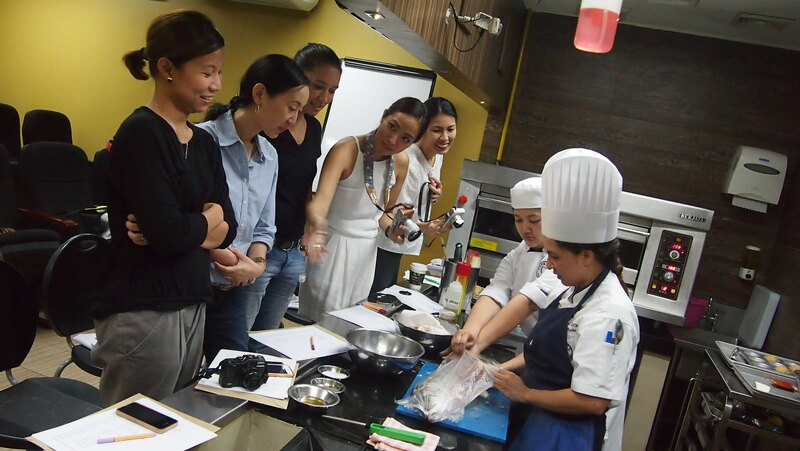 Global Academy offers Professional Courses and Epicurean Lab Lifestyle Courses. The Professional Courses are offered for aspiring chefs and pastry chefs while the Epicurean Lab is the culinary science department founded by Chef Robert Pengson. The Epicurean Lab offers demo and hands-on classes where students/professionals or mommies like us get to learn basic kitchen and cooking concepts, learn new recipes, kitchen tips and tricks, and actually cook and even got to take home everything you cook plus the recipes! 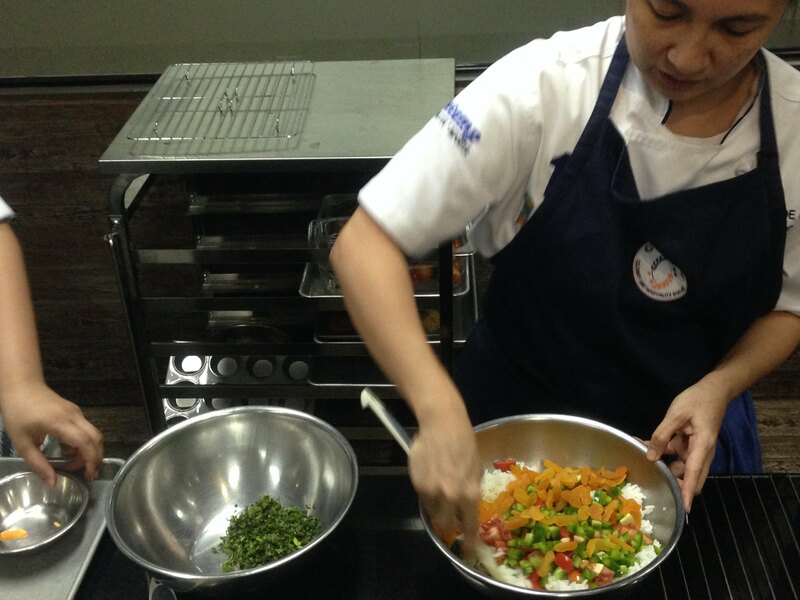 The Epicurean Lab is perfect for those who can't commit to full time culinary education. 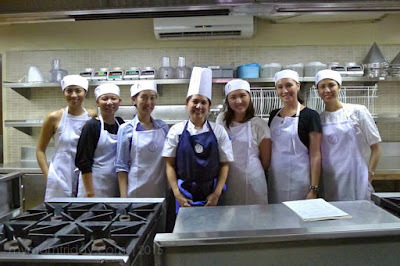 Before our cooking class last week, Chef Erika and some of us have already met earlier last year. 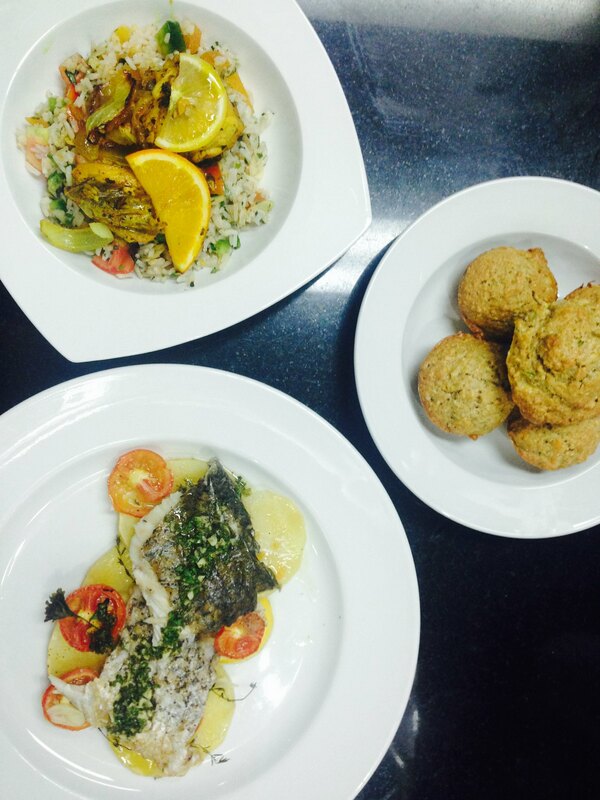 After several exchange of emails and messages, we all agreed to make the following dishes: Carrot and Zucchini Muffins, Citrus Braised Chicken with Turmeric, Mediterranean Rice Pilaf and Whole Roasted Fish with Herb Sauce. Calm before the cooking storm! 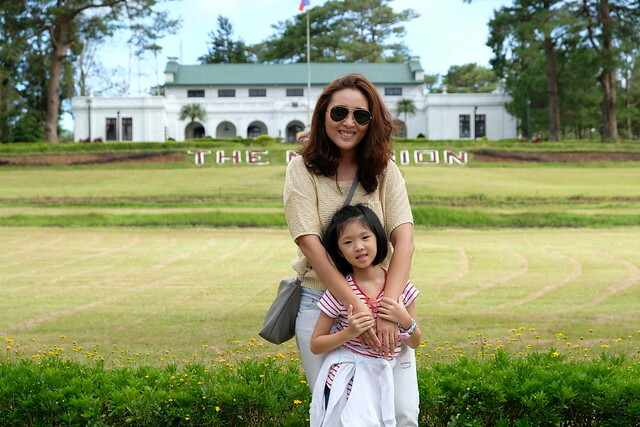 Photo grabbed from Jackie. 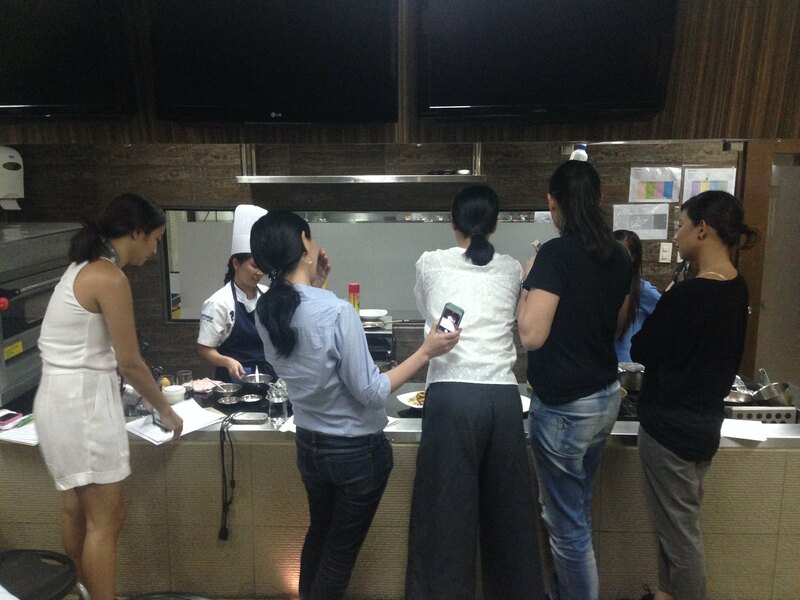 Before we did the cooking ourselves, Chef Erika demonstrated how each dish is prepared and cooked. This was where we had our lecture and demo. 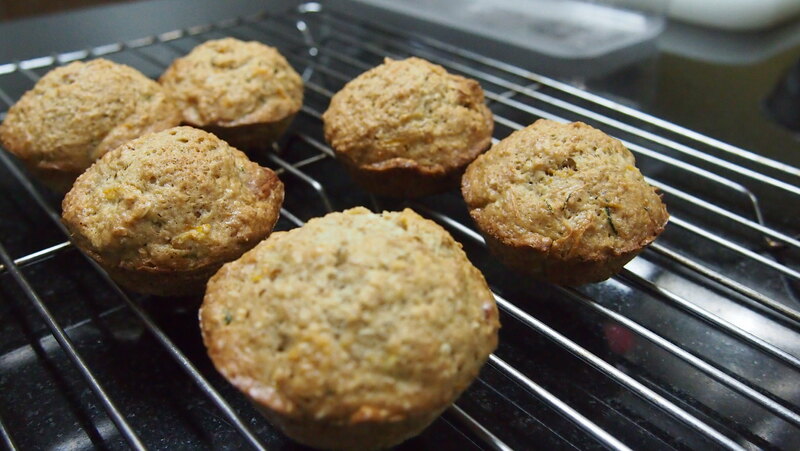 The first dish Chef Erika prepared was the Carrots and Zucchini Muffins. 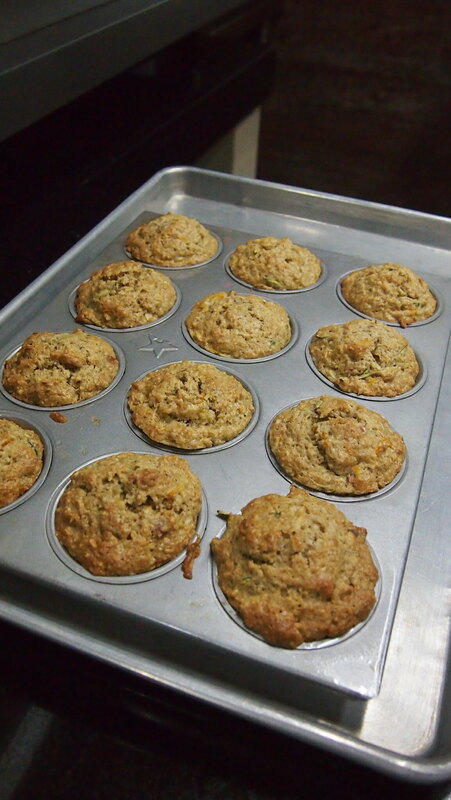 I have zero knowledge on baking so I was excited to learn how to make this muffin. 2. In one large mixing bowl, combine all dry ingredients. 3. In another bowl, combine eggs, canola oil, grated zucchini and carrots. Mix well then pour into the bowl of dry ingredients. 4. 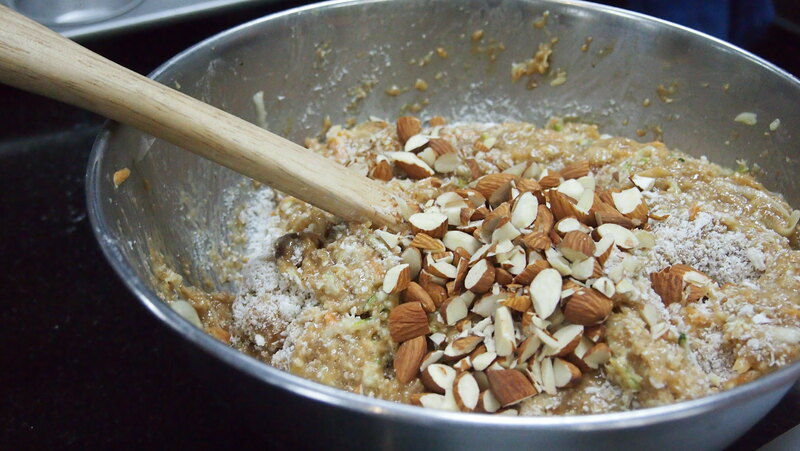 Mix gently and then when it’s almost well combined, add the walnuts and coconut and fold gently. Do not overmix. Tip: Mix the dry ingredients first then wet ingredients next before adding "additionals" like walnuts, carrots and zucchini. Toast the walnuts over low heat. 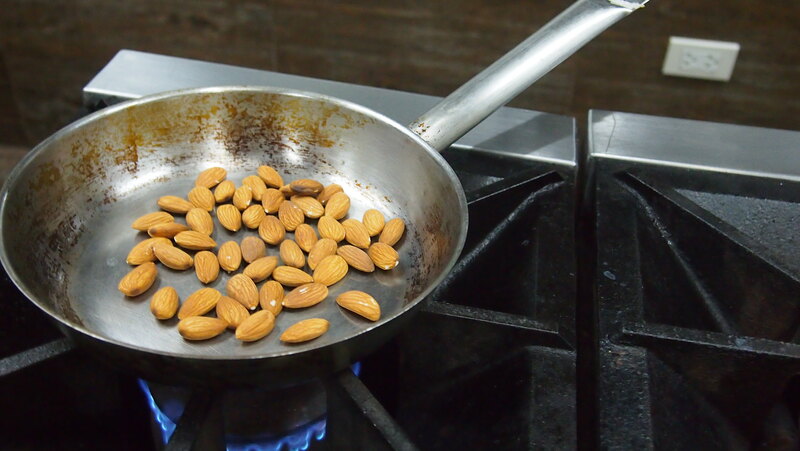 Walnuts can be substitute with almonds. Walnuts and dessicated coconut goes last into the mixture. Before and after! We snacked on the muffins while Chef was doing the rest of demo heehee! 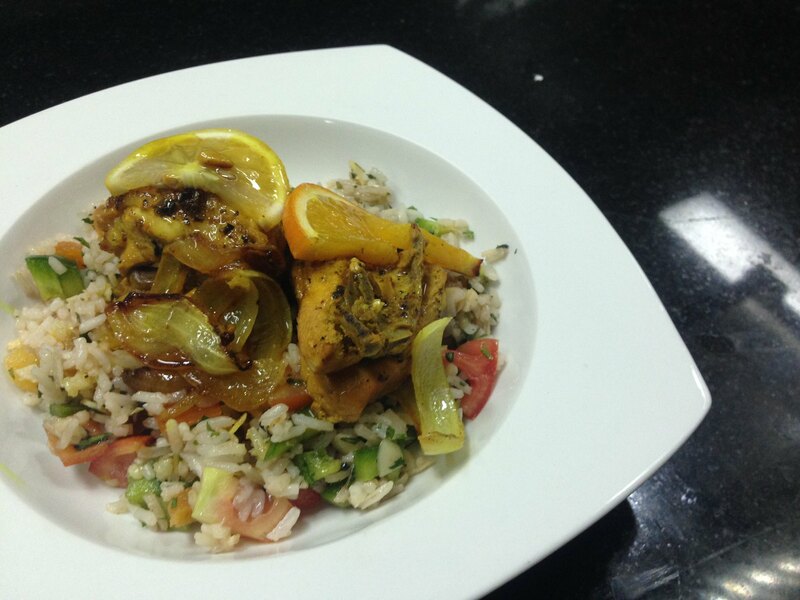 Next dish that Chef demoed was the Citrus Braised Chicken with Turmeric to be paired with Mediterranian Rice Pilaf. 1. 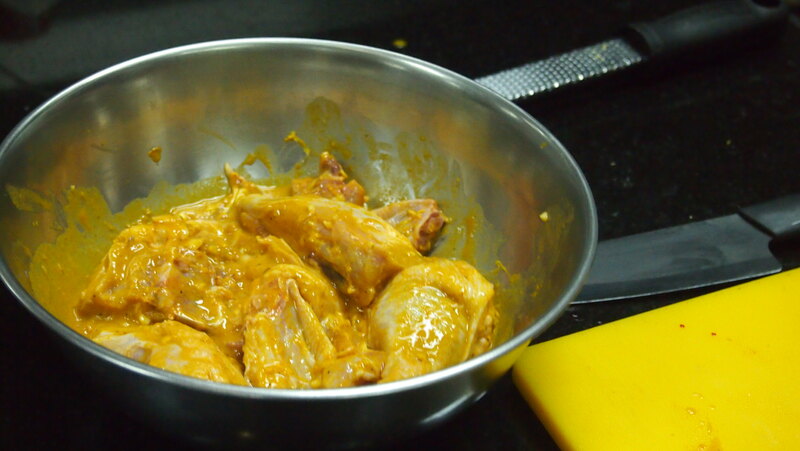 In a mixing bowl, combine chicken pieces, mustard, garlic, lemon zest and juice, orange zest and juice, ground turmeric, salt and pepper. 2. Toss well and allow chicken to marinate for at least 2 hours. 3. Meanwhile, cut the large white onion into 8 wedges. Slice the lemon and orange and set aside. 4. In a large saute pan, over medium heat, pour in olive oil and wait until it gets a little hot. 5. Remove excess marinade on chicken pieces and place the pieces in one even layer (it may take 2 batches). Do not overcrowd the pan. 6. Cook for about 1 minute or until the skin turns brown and turn the chicken pieces over. 7. Once the chicken pieces are browned, set aside. 8. In the same pan, you will find brown bits at the bottom so pour a little chicken stock to deglaze the pan. 9. Return all the chicken pieces into the pan. Add in the rest of the chicken stock and leftover marinade. Taste the cooking liquid if it needs salt and pepper. Adjust if needed. 10. Tuck in the pieces of onion wedges. 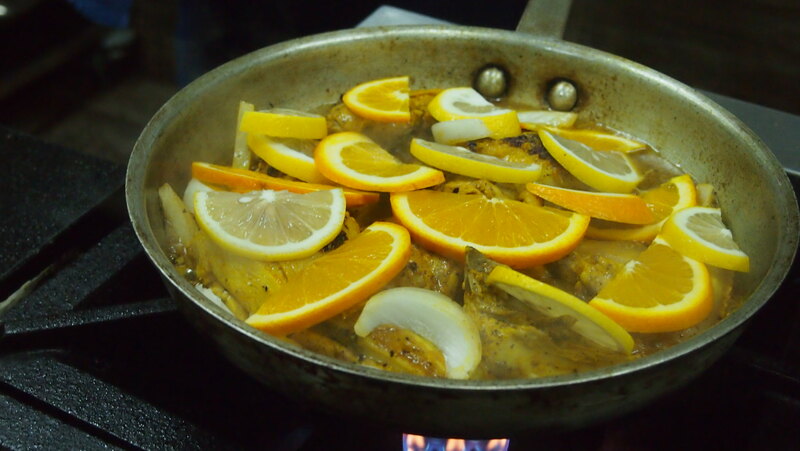 Top the chicken with a layer of sliced lemon and orange. 11. Cover well and lower heat. Braise for about 20-25 minutes. (or braise in the oven at 400F for about 20 minutes and uncover for another 5 minutes). 12. 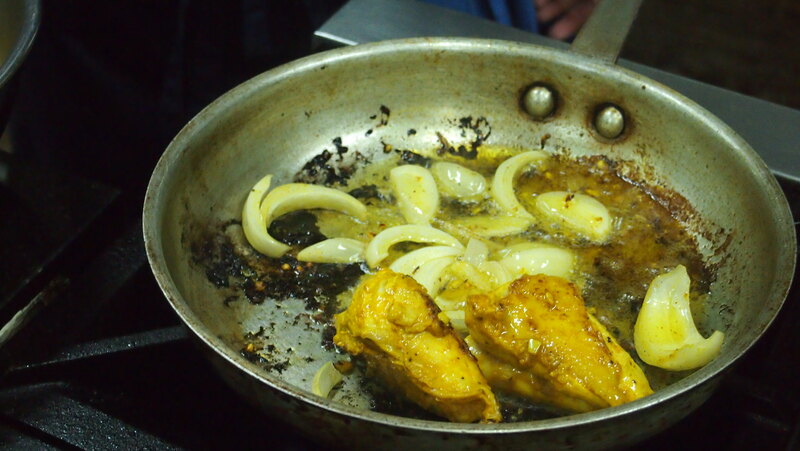 Check if the chicken juices run clear, no trace of blood. Allow to rest for 5 minutes before serving. 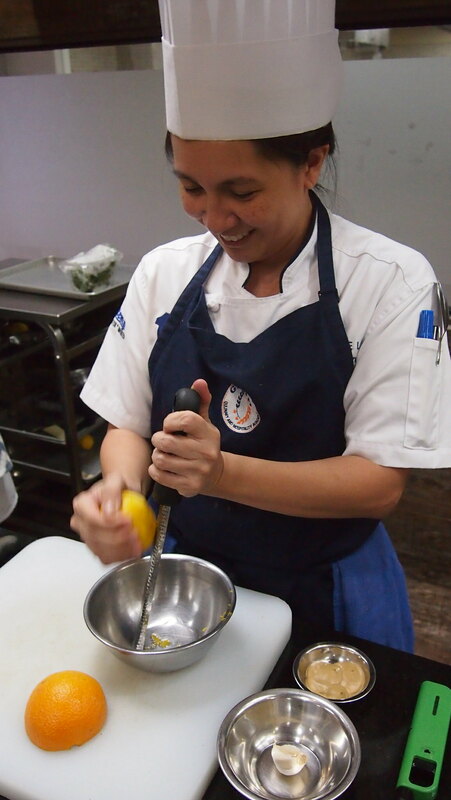 Left: Chef zesting the lemon using a microplane. Zest only the skin and avoid zesting beyond the white part because that part is bitter already. 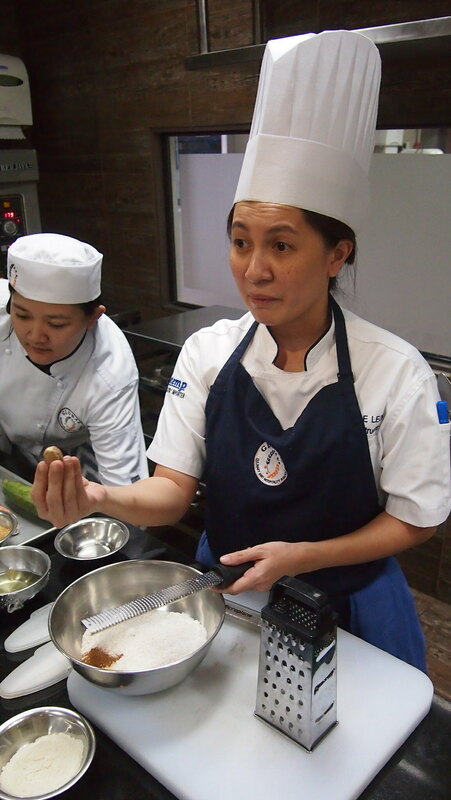 Right: Chef teaching us the correct way to chop a chicken. Find where the joints meet, break then chop. So there's no little bits of bones in your dish. Safety na din especially for us who have small kids. I never knew this! I always ask it to be chopped at the meat shop. The recipe says marinade for at least 2 hours. Chef said 4 hours is good but overnight marinade is the better so the chicken can absorb the flavor. See those black and brown bits stuck at the bottom of the pan, just pour a little chicken stock to deglaze the pan. That's where the flavor is! 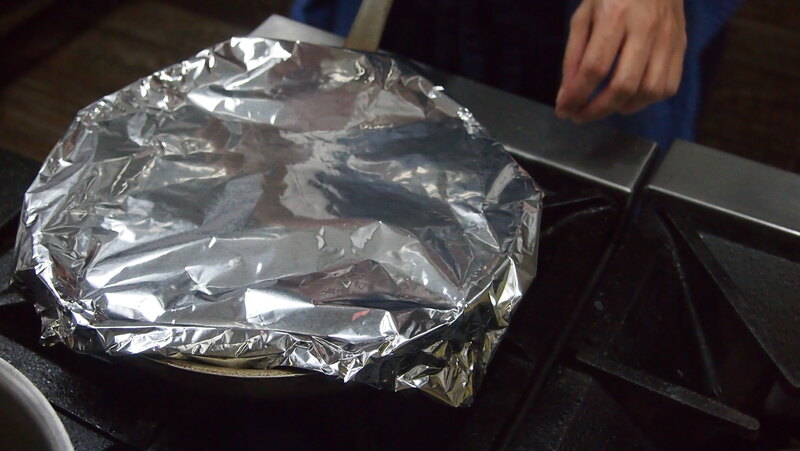 If you don't have an oven, not to worry, just cover and braise for 20-25 minutes! 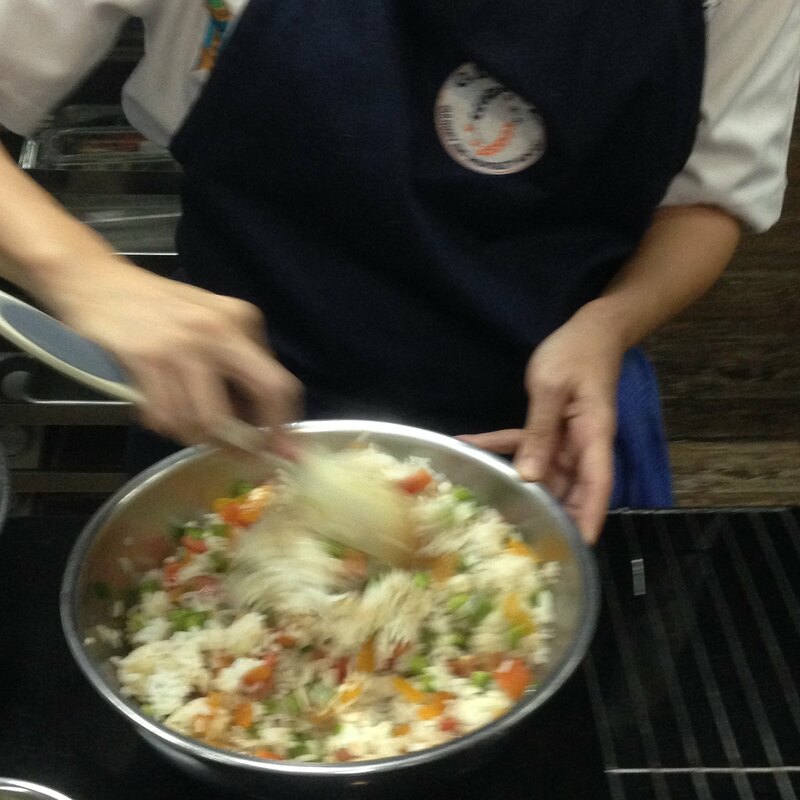 While waiting for the chicken to finish cooking, Chef started making the Mediterranean Rice Pilaf. 1. In a small sauce pot, add rice with equal part water. Cook until fluffy. 2. In another small sauce pot, boil about 1 ½ cup water. Add burghul wheat and stir. Turn off heat and cover well until wheat absorbs all the water. 3. While waiting for the starches to cook, chop the green bell peppers, tomato, dried apricots, and fresh herbs. 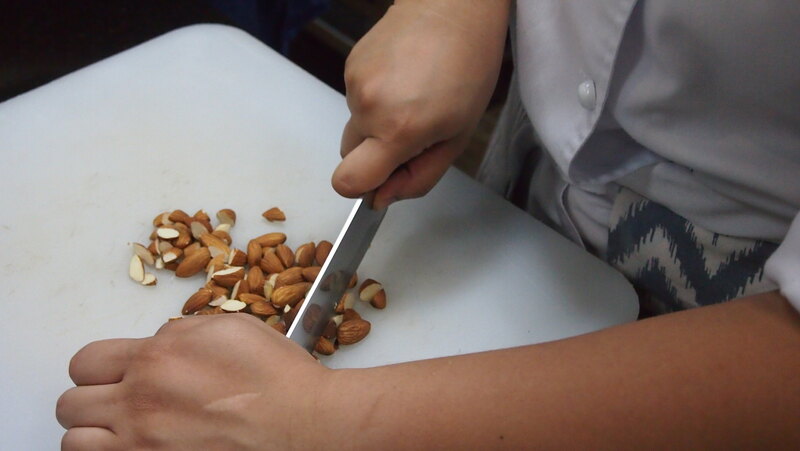 Toast the shaved almonds. Set aside. 4. Before the starches are done cooking. Prepare the vinaigrette. 5. Combine the extra virgin olive oil, balsamic vinegar, garlic, lemon zest and juice. 6. Season with chili flakes, salt and pepper. Taste and adjust the seasoning if needed. 7. In a big mixing bowl, pour in the warm cooked rice and cooked burghul wheat. Toss in a little of the vinaigrette to give it flavor. 8. Once the starches are fluffy and not sticky, add in the chopped ingredients. 9. Toss and add more of the vinaigrette. 10. 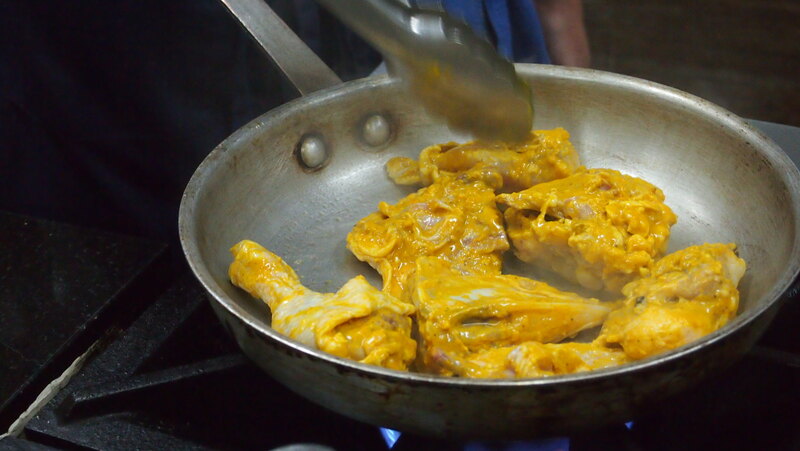 Serve with the Citrus Braised Chicken with Turmeric. Then prepare the vinaigrette before mixing everything! When the rice and burghul wheat are cooked, you can mix everything! 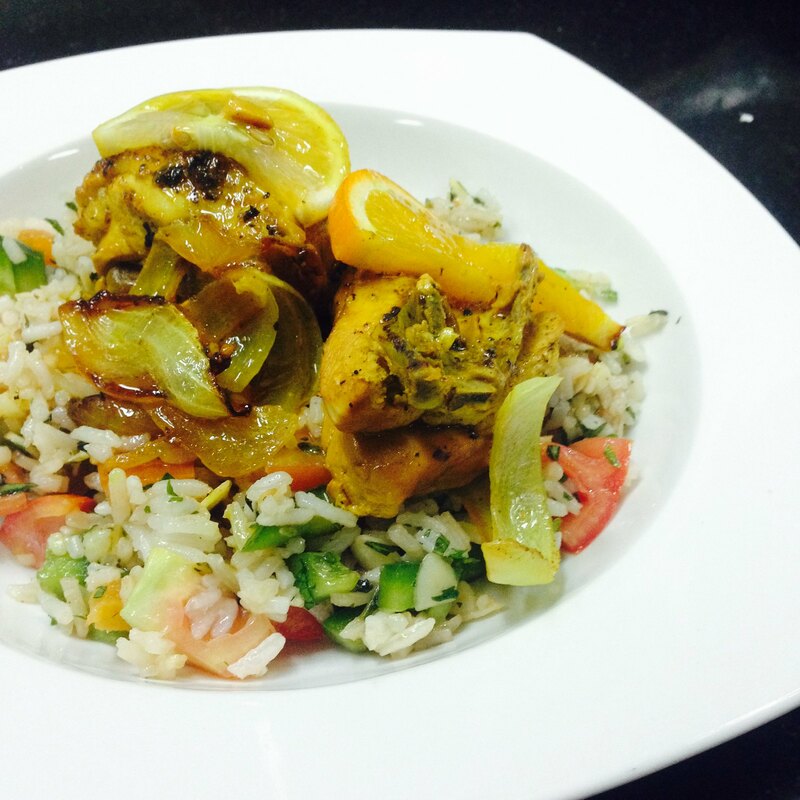 Once everything is mixed, plate your rice pilaf then top it with the braised chicken. 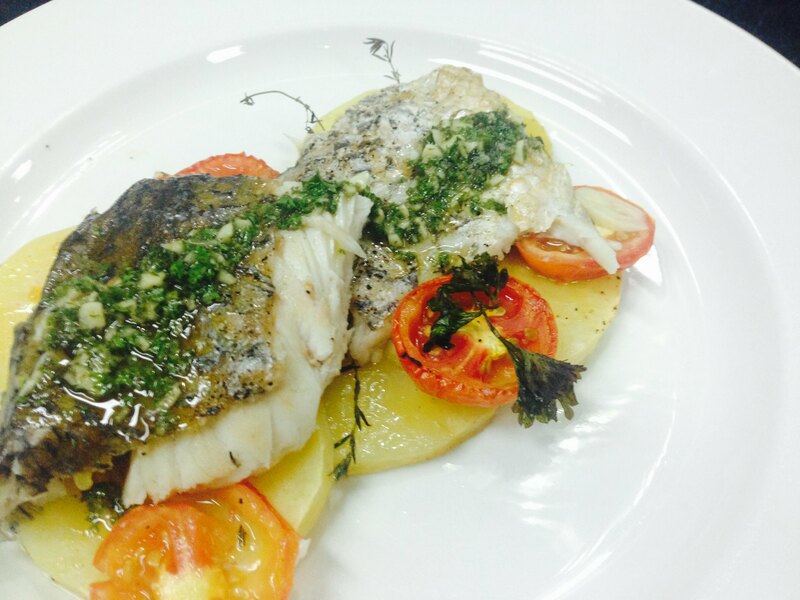 And last but not the last dish was the Whole Roasted Fish with Herb Sauce. 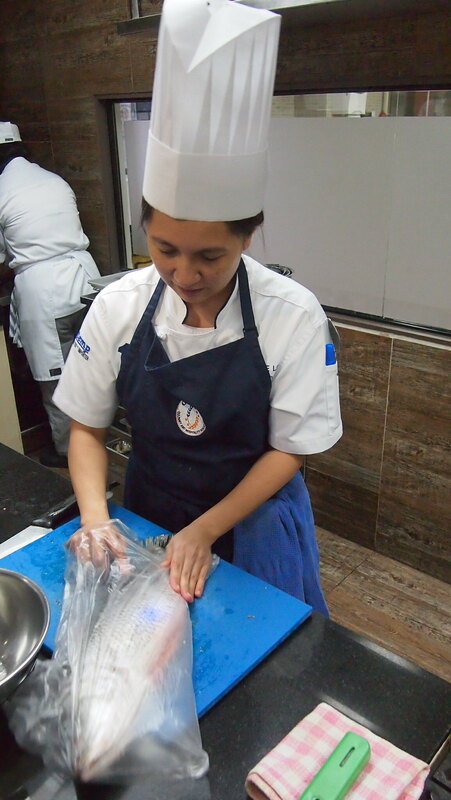 When we were still exchanging emails and picking out what we were going to cook, Mish asked us if we wanted to learn how to scale and clean a fish. We all eagerly said yes! 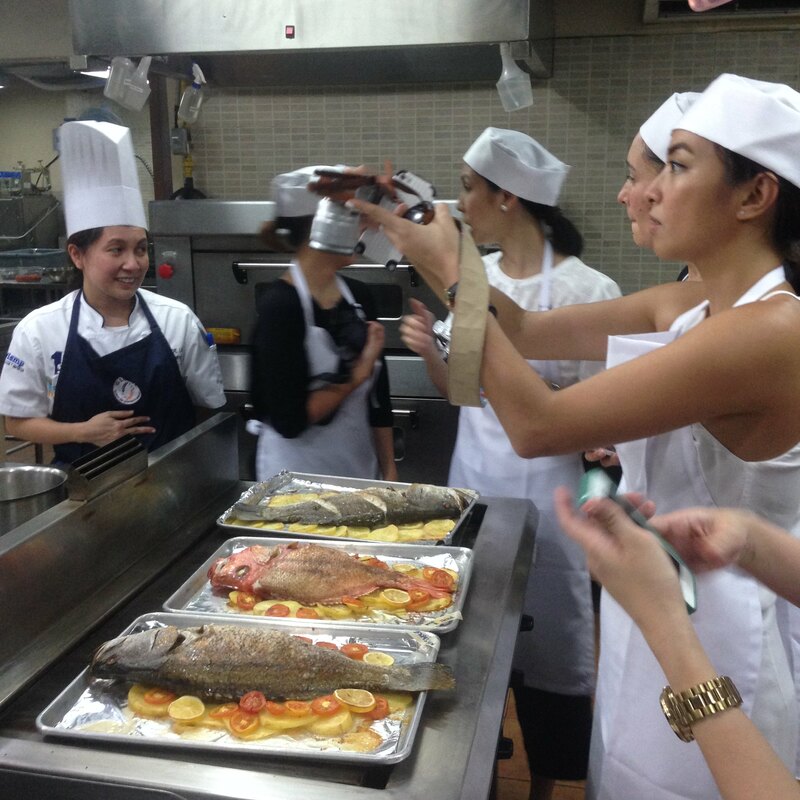 And chef showed us how it is done, except we didn't expect the fish would be HUGE! Haha! And when say HUGE, it's really HUGE! 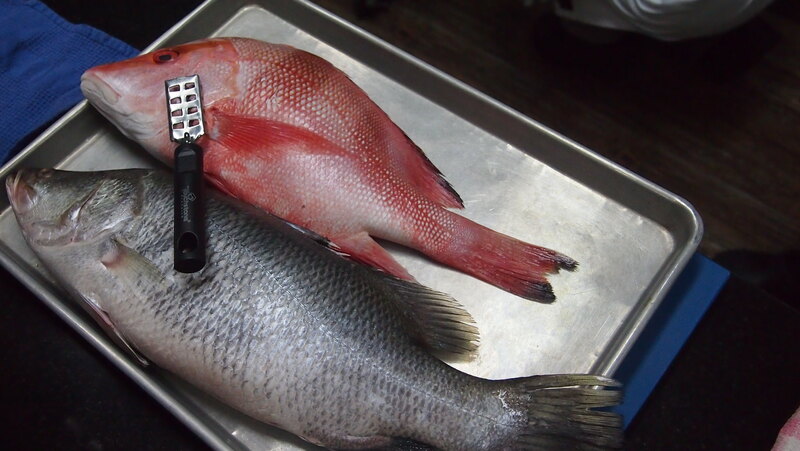 Tip: To avoid the scales to spread all over your kitchen, put the fish inside a plastic before scaling it then you can just throw the plastic away when you're finished. The manongs at the palengke make it look so easy to scale, gut, and clean fishes! 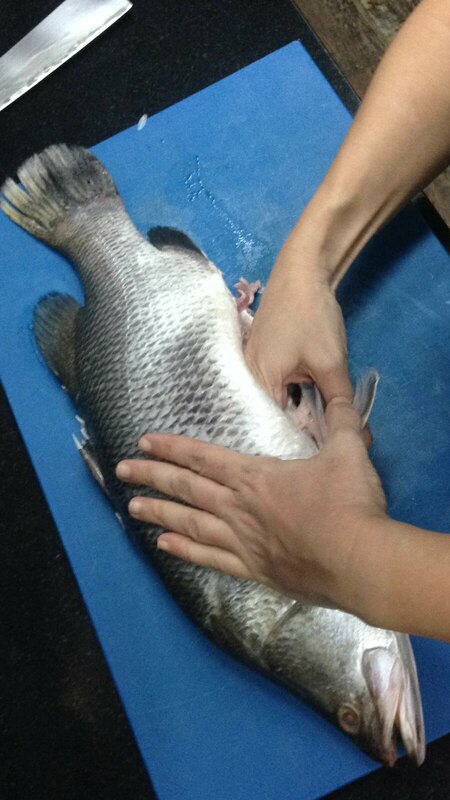 After seeing Chef Erika do everything, we changed our minds and asked if we can have the fish scaled and cleaned for us. Heehee! Plus we were pressed for time na! I can see thought bubbles in this picture! "Gagawin talaga natin to? Joke lang to diba?" Haha! 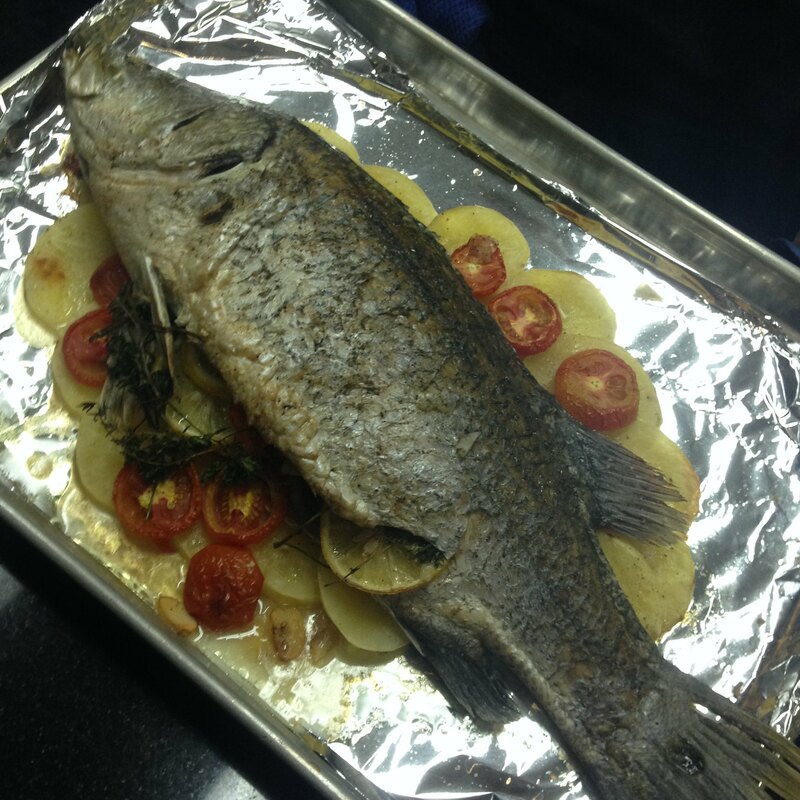 Once the fish was ready, it was time for it to be stuffed and roasted! 2. 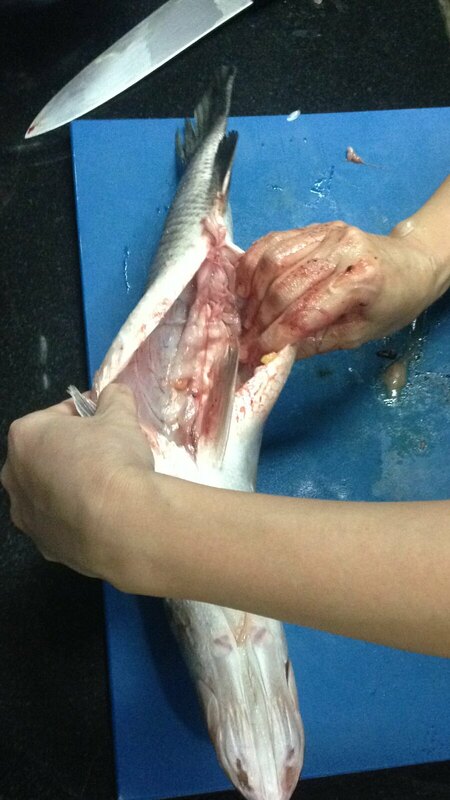 Clean the fish, removing the scales, gills, and any innards. Rinse well. 3. Inside the cavity, lightly season with salt and pepper. 4. Stuff the cavity with slices of lemon, tomato, and garlic and continue to stuff more with fresh parsley, thyme, and bayleaf. 5. On a baking tray line with foil. 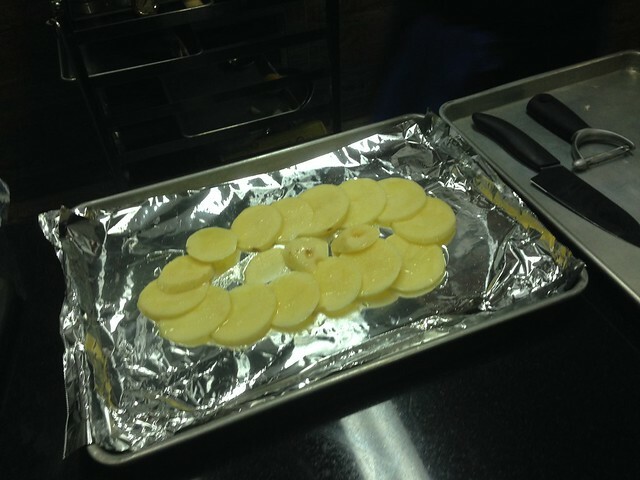 Arrange a bed of sliced potatoes. Drizzle with a little olive oil, salt and pepper. 6. 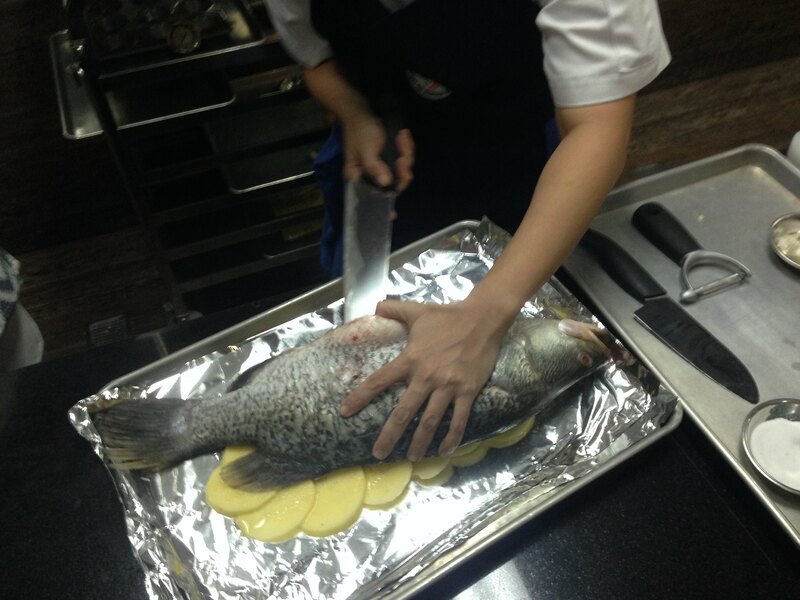 Place the fish on top and rub some olive oil onto the skin. 7. Roast the entire stuffed fish in the oven for about 20 minutes. 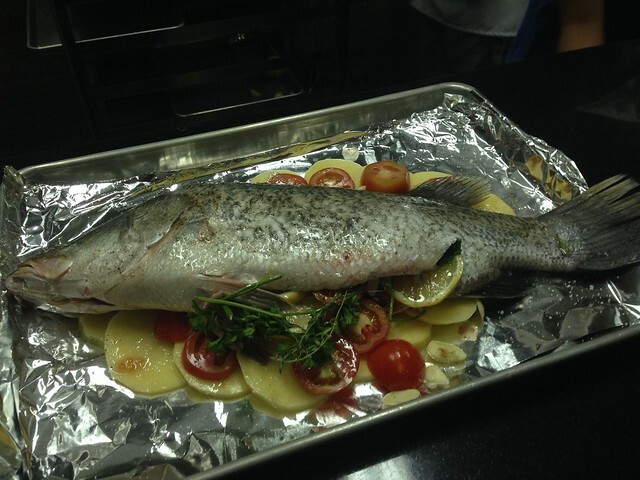 Remove from oven and allow to rest for 5 minutes before serving or cutting into the fish. 8. 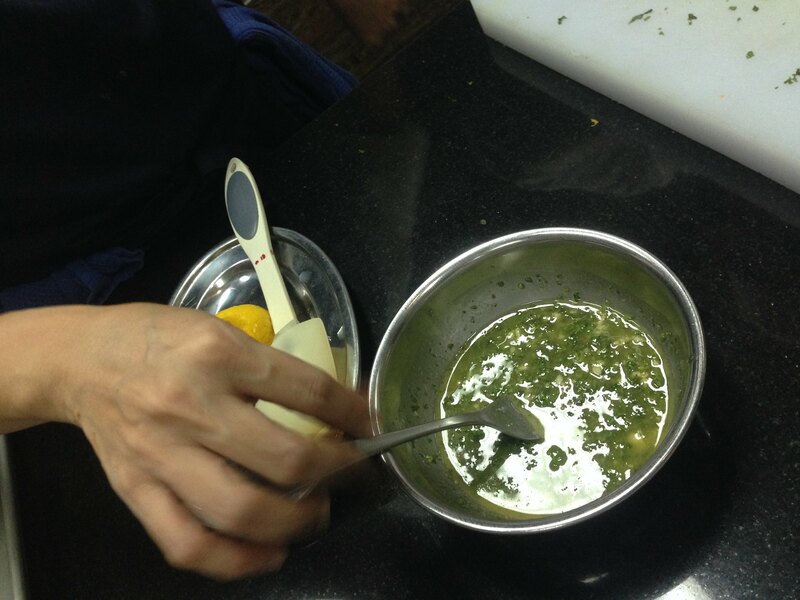 To prepare the herb sauce: gently warm the olive oil and butter in a small pot or pan. Remove from heat. 9. Add in the garlic and fresh herbs. Whisk in the mustard, lemon zest and juice. Season with salt and pepper. Taste and adjust if needed. Allow to sit for about 10 minutes. 10. Serve with the herb sauce on the side. Don't forget to season the potatoes before putting the fish on top! Barri all stuffed and ready to go! And here's Barri ready to be served! I loved that herb sauce! It can be used for other kinds of meat like chicken, seafood and pork! After showing us how the dishes were prepared and cooked, it was now our time to pair up and apply what we learned and cook everything!!! The pressure was on! 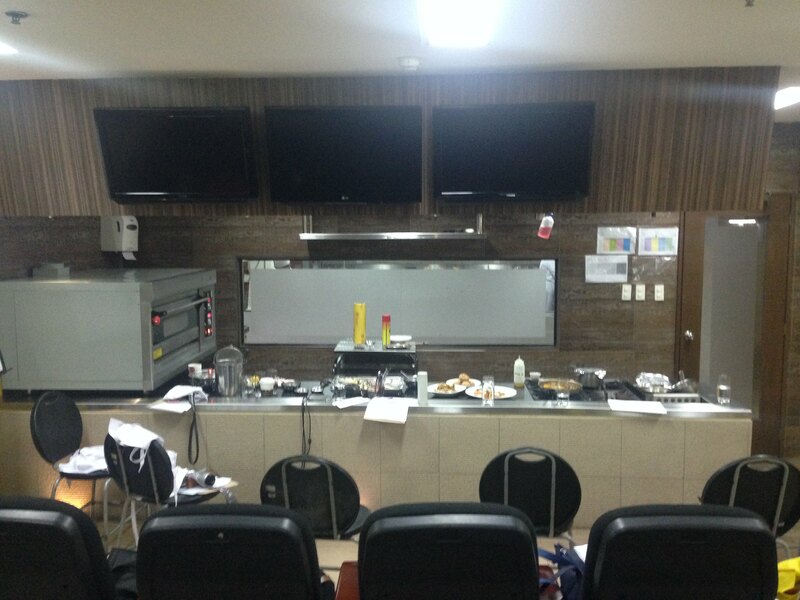 When I entered the kitchen, dun na ako kinabahan!!! I felt I was in Hell's Kitchen and someone's going to shout at me if I don't something right! Hahaha! 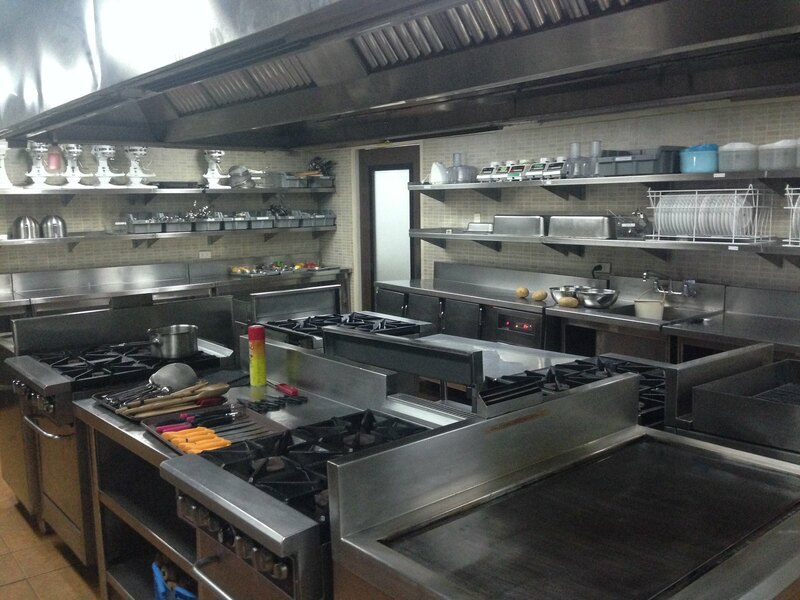 The all-stainless-steel feel of the kitchen excites me but at the same time made me feel intimidated and challenged. Haha! This was our battlefield that day. Who wouldn't get intimidated by this kitchen? Hehe! 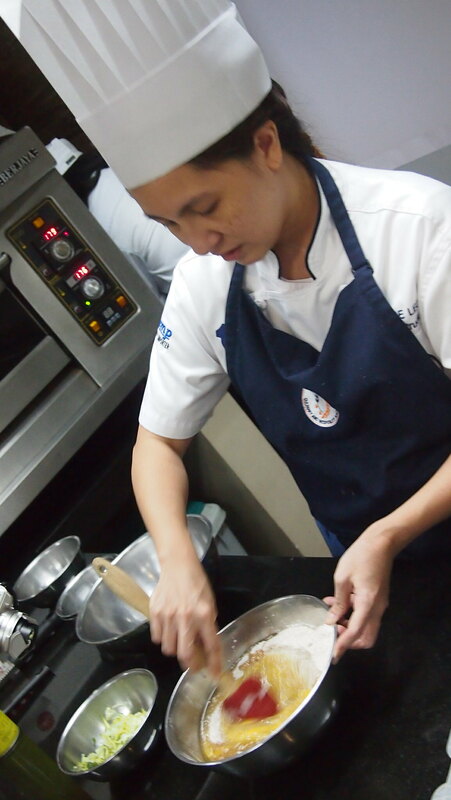 And I got to be paired with Tina who's a superwoman in the kitchen! 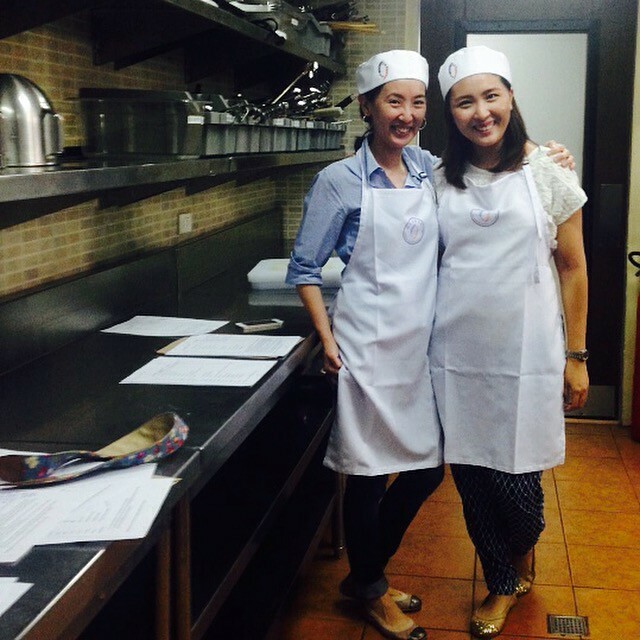 We make such a good team and I had so much fun cooking with her! My partner cooking the chicken! While I do the chopping, peeling, and mixing of sauces! Here I am peeling potatoes just like Princess Sarah. Heehee! Mommas busy doing our own assignments. 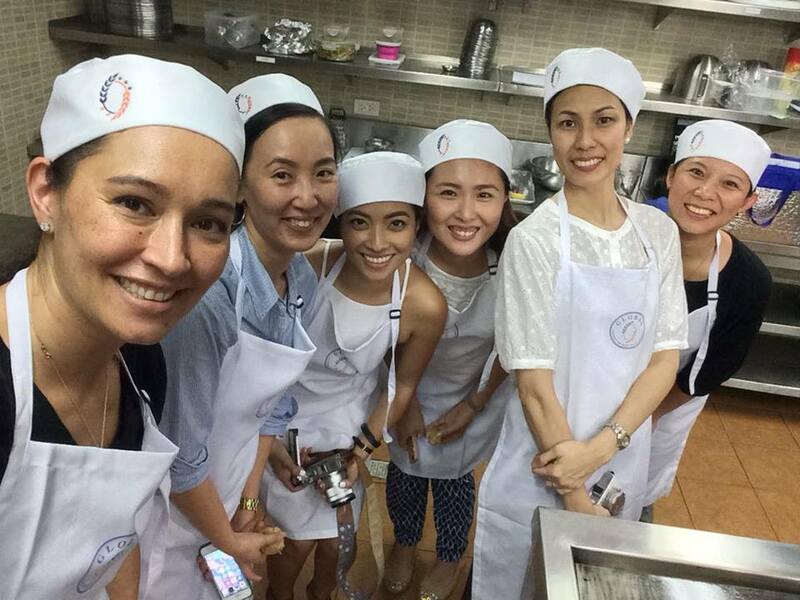 It was so much fun cooking together with the SoMoms! And after more than two hours in the kitchen, here we were taking photos of our fishies! And we were able to cook everything! Good job mommas! And we got to take home what we cooked for our families! I didn't cook for the next two days! Yay for for me! Congratulatory selfie! Good job mommas! 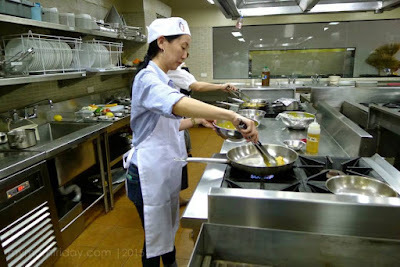 Let's join a cooking class again!!! Thank you Chef Erika and assistant Chef Bianca! And thank you to Global Academy for having the SoMoms! 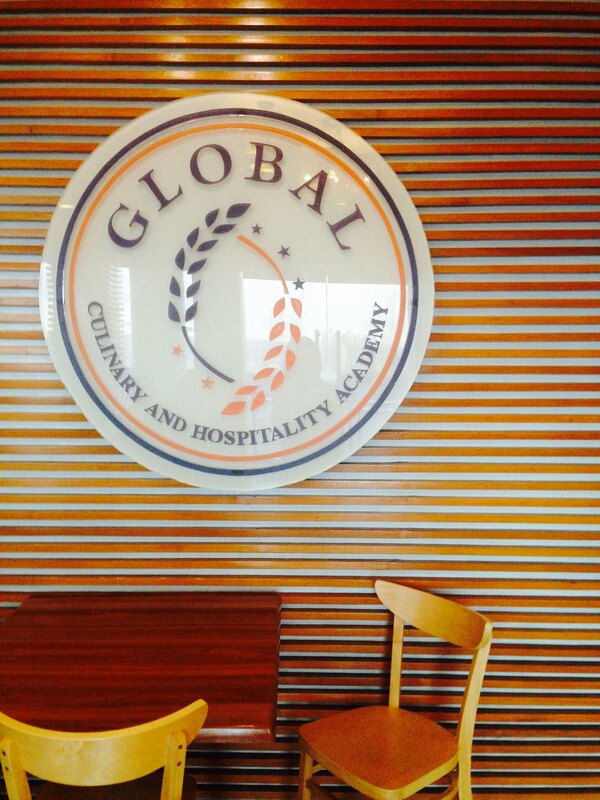 Thank you Global Academy for giving me the chance to experience what it is like to be a "chef" for day. My sister and a couple of friends took HRIM then culinary school and they always said it's so tiring and now I understand! I only stayed in the kitchen for more than 2 hours and I feel tired, what more for chefs who cook all the day in the kitchen! I now certainly have more respect for chefs.